Corfu - the northernmost of the six main Ionian islands is also supposed to be the greenest of them all. It has been a crossroad where many different nations and cultures have been mixing for centuries. It is still a bit like that today. We had arranged a reservation of an apartment in the town of Pirgi which is inseparably connected to a bit more famous party town of Ipsos. This town is actually a Greek version of Ibiza. If you are wondering what is the cheapest way to get to Corfu, you should check out one of my previous posts, but if you still prefer Spain, there are always many cheap flights to Ibiza available from many destinations around Europe. This time our chosen mean of transport was a ferry from Venice to the town of Corfu (Kerkyra). 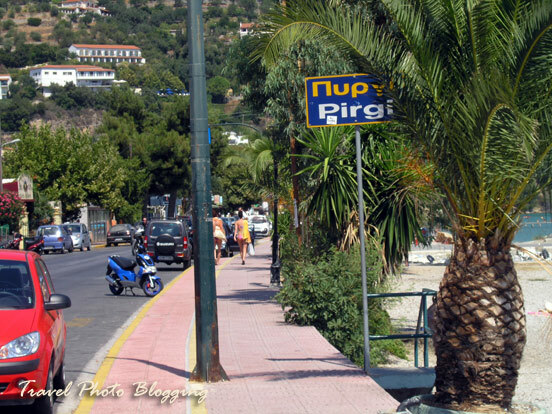 Pirgi (or Pyrgi) is located 15 kilometres north of this largest town on the island of Corfu. From the first look of the island I did not know what exactly to think of it - it was dark when we arrived. I guess this might be the main reason we were quite impressed with our apartments when we saw them. There was a nicely lit pool in front of the house with a well stocked bar standing right next to it. Even in the morning apartments with a rather fancy pool looked quite nice - from afar that is. This trend could be noticed with most of the places lined up by the main road across from the beach in the towns of Pyrgi and Ypsos. However I am pretty sure many of the visitors do not even notice this. Most of those places were empty throughout the day and filled up well after dusk when such "details" are less obvious. Since we were usually exploring the island during the day, we did not mind those things all that much. However if we wanted to do the exploring, we had to rent some kind of transport - we opted for a couple of scooters. Hello, I'm the webmaster of Travel Pictures ( you can find this blog in your blog's blogroll ), I would like to announce you that TP is closed, but we opened a new travel-photography blog which is called Photography Only ( here is the link: http://photographyartblog.blogspot.com/ ) . I would like to ask you if you are interested in a link exchange between Photography Only and your blog. I’ve already added your blog to my blogroll and if you are interested, please add Photography Only to your blogroll. Thanks and have nice day. Thanks for the notice. I have changed the link. I hope your new blog grows to be at least as successful as the old one. Keep blogging!